The Carle's Cable Dog Sweater Jacket - Navy will have your dog ready to face the elements in warmth and style! Cuddle up this chilly season with the Carle's Cable Dog Sweater Jacket - Navy! Heavy cable knit sweater with fold down collar, leash opening, and European cut at belly for comfort. 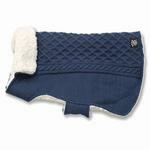 Its fleece lining will keep your pup nice and cozy in cold conditions. Super soft 100% Acrylic material. Machine was cold, tumble dry low. Posted On 01/26/18 by Christine L from , PA Yes, Christine L recommends this product! I have received so many compliments on this sweater/coat! And I love it. It's made well, and seems like it's warm for my dog. And she just looks so darn cute in it! WHAT A GREAT SWEATER/COAT!!! I appreciate having a website with so many pet gift options and like getting coupon codes.